When you see high school through the eyes of an American teenager who has mastered the art of sarcasm and dead-pan facial expressions, you can only expect episodes of bizarre hilarity and whacky characters that make teen-angst an experience you want to have again and again. Daria – The Complete Series is a character-driven animation series that will befriend those who appreciate pessimism as a form of humour, a way of life, and a shield against the moronically insane. From her first day of school to her later grips with adulthood, Daria is filled with laugh-out-loud moments and witty one-liners that are balanced with the more serious ideas of family bonding, friendship and simply getting along with people who just aren’t your kettle of fish. With her best friend, Jane Lane, and a couple of crushes on inconvenient boys, Daria gets through her teens with a TV show titled ‘Sick Sad World’ and a no-tolerance attitude for superficiality and idiocy. As an outsider at school and the voice of cynicism at home, Daria’s experience of adolescence is a test of survival as she finds herself wedged between the anxiety-ridden antics of her father, Jake, the overbearing, over-worked presence of her mother, Helen, and the fashion-club popularity of her sister, Quinn, at school. Daria’s conflicts and triumphs at home and in the corridors of Lawndale High then show different sides of her personality that go hand-in-hand with growing up and becoming the decent human being she wants to be deep-down. So while it’s not in Daria’s best interests to care, the journey of high school and the dramas that manage to reel her in slowly bring out aspects of her personality that show she has more heart than her pokerface gives away. Throughout the seasons of Daria, the consistency of the series’ sarcastic humour and oddball characters surprisingly never gets old as episodes expand and amp up the tense relationships, history and distinctive traits of the incomprehensible and outlandish people who populate Lawndale. In this sense, Daria is economical with its jokes and cleverly develops its characters without making the series feel too repetitive or dull. Endowed with distinctive looks, dress, vocal talent and personalities, the characters of Daria interact and bounce jokes off each other with a sense of humour that is as unique as their visual construction. With 90’s rock, pop and a theme song that perfectly captures Daria’s attitude, Lawndale is complete with a perfect atmosphere for biting teen critique that is grounded in such a particular culture and time, and yet, manages to be entertaining years later. Despite the fact that the series is based on teen experiences, it doesn’t necessarily aim to win popularity points off a teen audience. 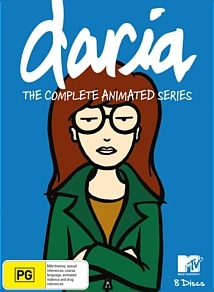 The series itself is a bit of an outsider, like Daria, in the sense that it is more likely to gain a cult status, than a mainstream appreciation. So if you can appreciate pessimism, cynicism and sharp sarcasm in the midst of insane, moronic and utterly ridiculous characters, Daria may just become your best friend for seasons at a time.